The MACPA kicked off our fall series of Professional Issues Updates for our members at the Shepperd Pratt Conference Center. These engaging and informative sessions are the foundation of our “24 hours of free CPE” promise to help our members through these challenging economic times. 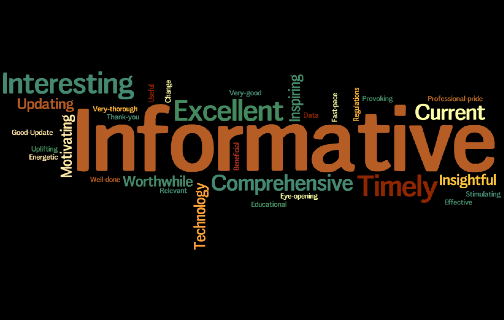 The member feedback was extremely positive, as you can see by the “wordle” from the comments and a 98 percent approval rating of our legislative / regulatory agenda. The themes of this update centered on technology (cloud, Big Data, mobile and social), regulatory (legislative and standards) changes, and new opportunities and emerging leader issues. This is also the first series to include the MACPA Live talks from our keynotes at our Innovation Summit this past June. Featured were CPA2Biz, CCH, Avalara, and Office Tools Professional. Check them out on our YouTube channel. This year features all-new content and covers “Blacks Swans,” Big Data, talent shortage, mobile, cloud, and of course the latest on standards, regulations, and legisaltive changes that CPAs need to know. Still plenty more to come as we travel around Maryland. Register here for the next town hall meeting. MACPA Technology Conference, Oct. 4. Register here. Digital CPA Conference, National Harbor, Md., Oct. 28-30. Register here. Swearing-in Ceremony for New CPAs, Nov. 1, BWI Hilton. Register here. MACPA Leadership Academy, Dec. 4-6. Info and registration here. MACPA Day in Annapolis, Jan 16, 2013, Info and registration (2 hours of free CPE) here.